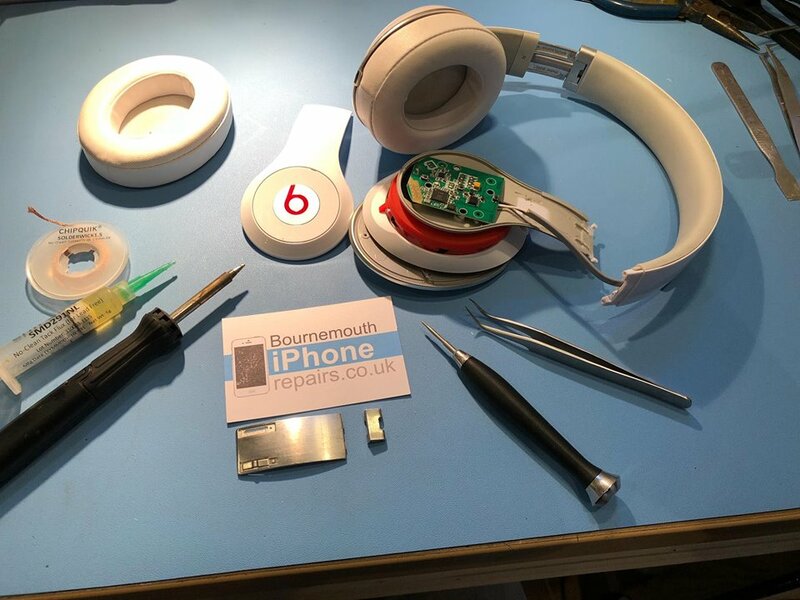 Beats solo 3 wireless headphones in for repair. A new folding joint was fitted to replace one that snapped during use. 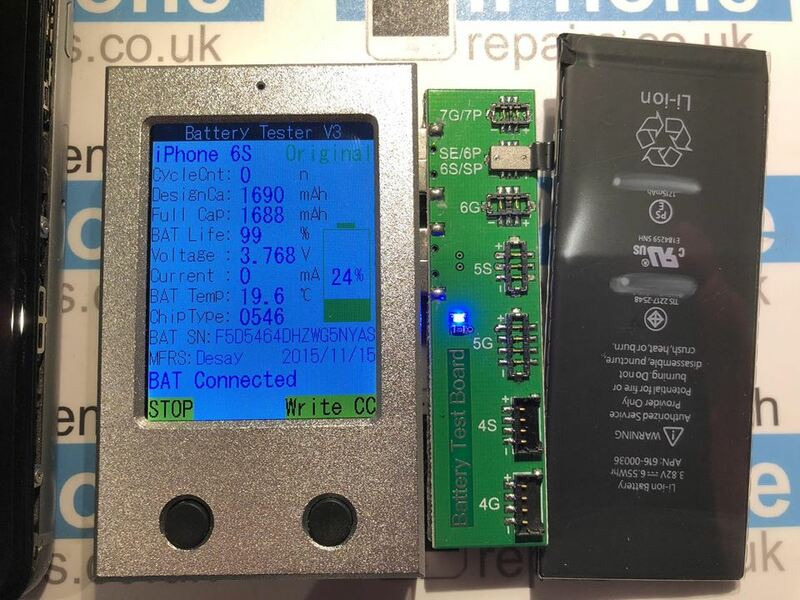 Installing a new battery to an iPhone 6 or newer can bring a new lease of life. iOS 11.3 was released today. It offer a new feature, allowing you to check the maximum battery life capacity and turn off automatic performance throttling if your battery is old. However if you do turn off performance throttling you may experience unexpected shutdowns as the battery is no longer able to supply enough current to support full speed. 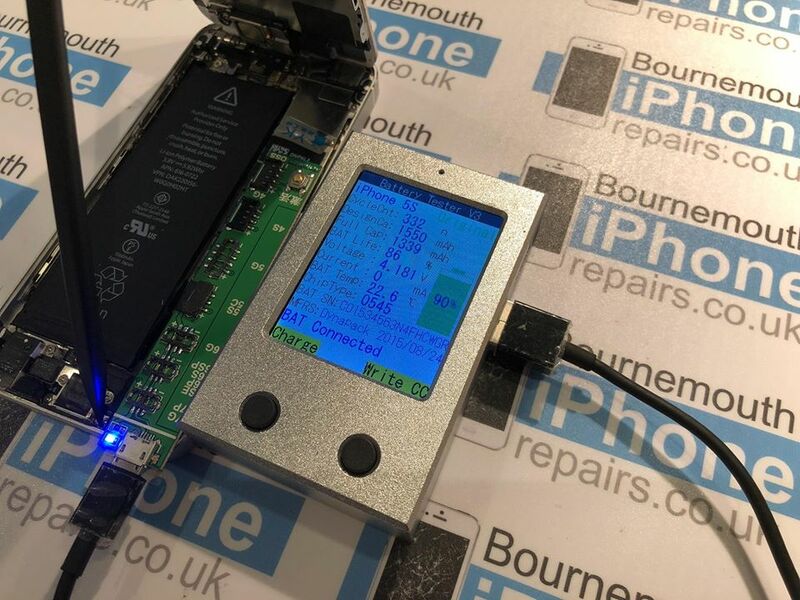 If your maximum capacity is less than 80% or your peak performance has been throttled automatically, then come to Bournemouth iPhone Repairs to get your battery replaced using a genuine Apple part. You’ll be able to give your iPhone 6 or 6S a new lease of life letting it run at full speed again. Txt 07887803967 to get a quote. Beware cowboy battery repairs in Bournemouth. 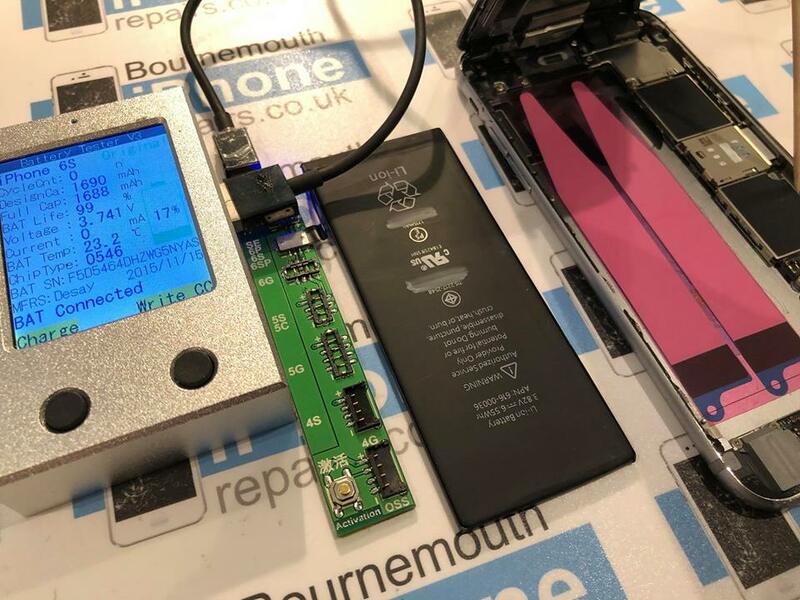 A customer had their battery replaced recently by a shop in Bournemouth, they fitted a non-original battery using super glue to secure it to the rear shell. Th customer had doubts when the battery failed to last the day. When we plugged it into our diagnostic machine, it had dropped 3% battery life in under a month. Terrible! 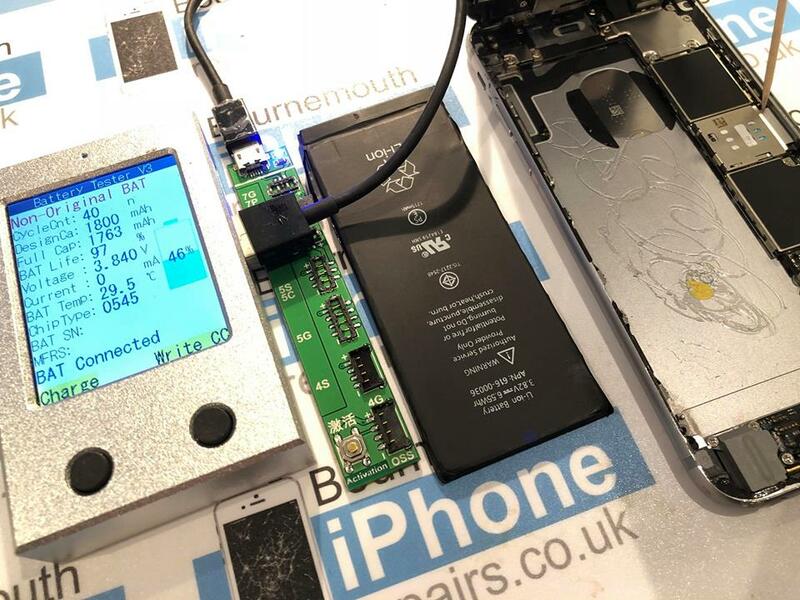 We fitted a genuine Apple battery using original adhesive. After a full charge it’ll hit 100% battwey life capacity. We offer 90 days no quibble guarantee on all our repairs, don’t go to a cowboy shop, come to us first! 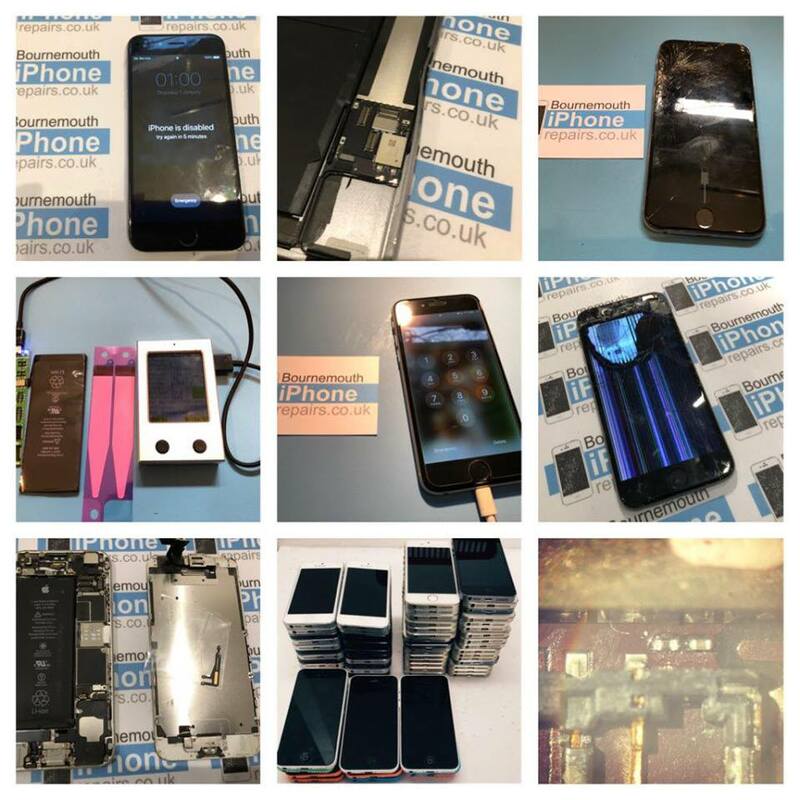 Its been only screen repairs this week. 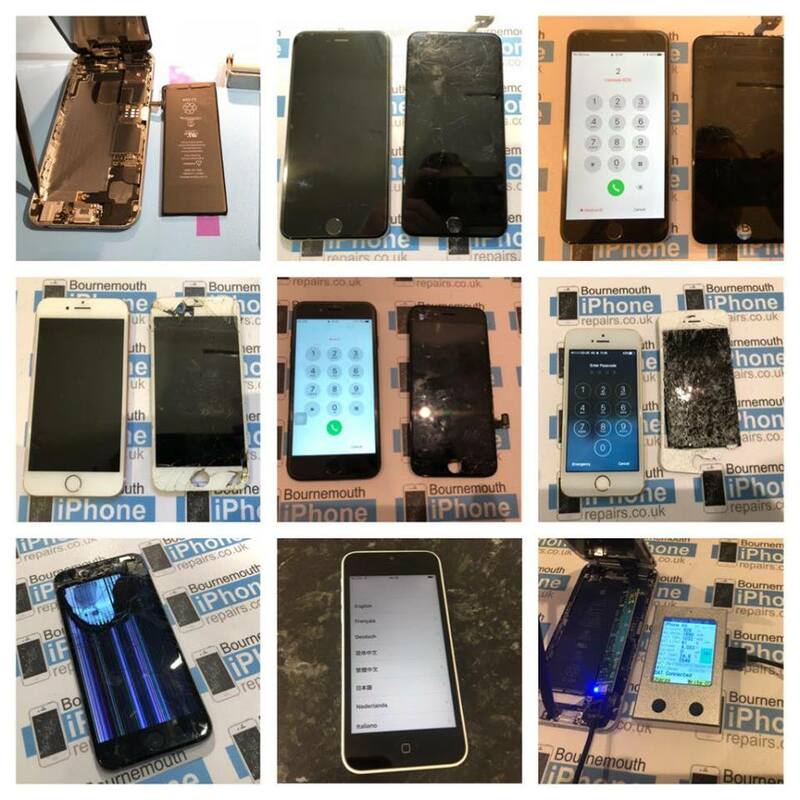 Some of our repairs from this week. 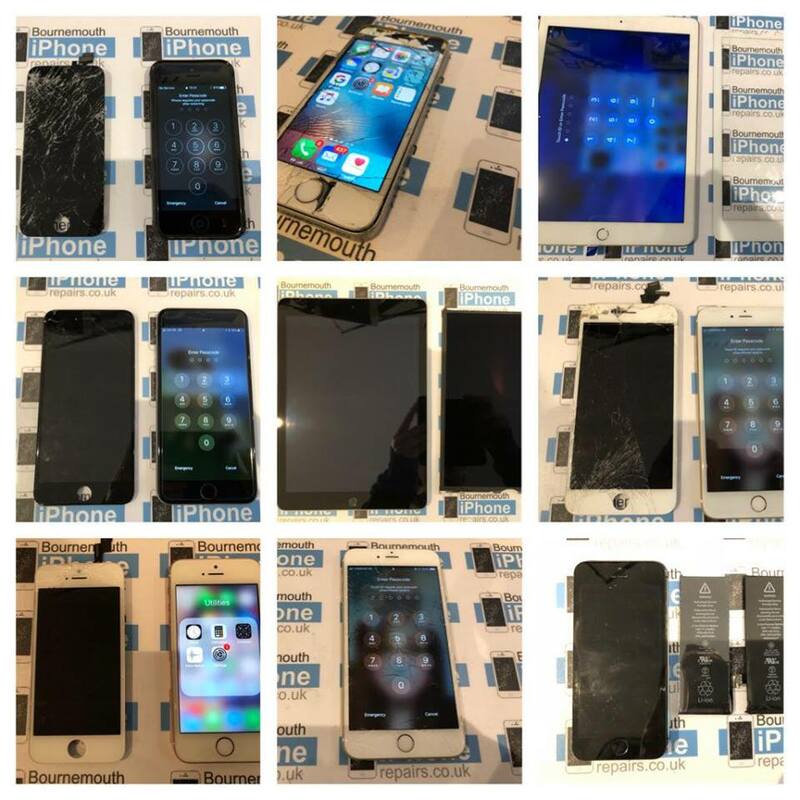 iPhone 5S & 5C refurbishment for resale. IPhone 6 – Broken LCD and top glass. It’s been one of the busiest Saturdays we’ve had this year, 11 repairs in 5 hours, including 2 iPad Air’s. 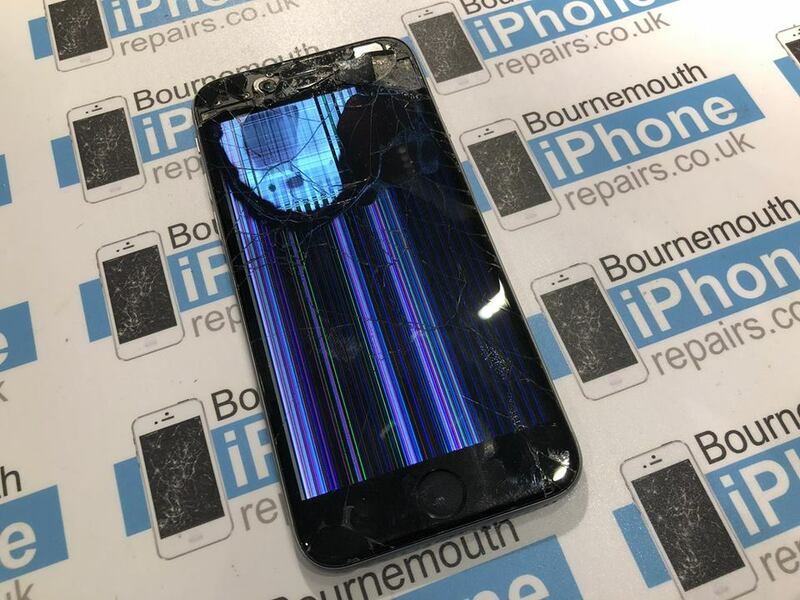 Thanks for choosing Bournemouth iPhone Repairs! An iPhone 6S came in with battery issues; shutting down and poor battery life. We removed the battery and put it on our battery tested. 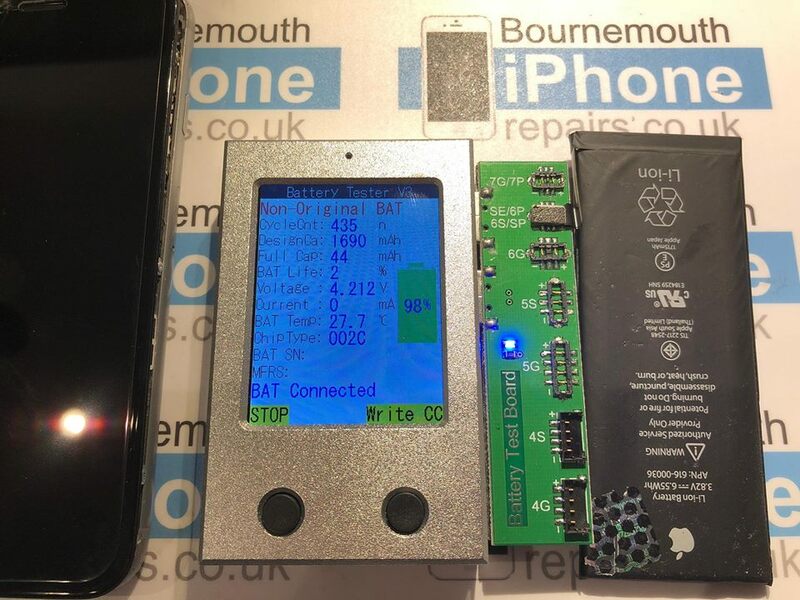 It was identified as a Non-Original battery, that had been charged 435 times and could only hold 44% of its original capacity. We replaced it with an original Apple battery, with zero charge cycles and 100% of its original capacity. All for just £30. If you need a battery replacement, let us know. iPhone 6s brought back from the dead! iPhone battery testing. 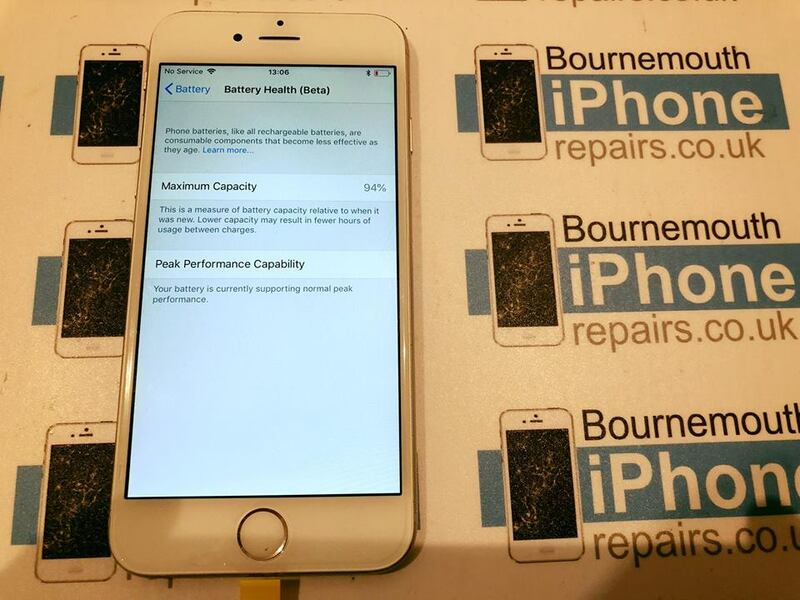 A customer brought in their iPhone 5S for a battery diagnostic appointment. On this occasion it didn’t need to be replaced. We recommended the customer adjusted some of their iOS settings to reduce wear. If your battery reads below 80% of the original capacity, then you’ll notice a definitive improvement in battery life by replacing it. Send us a message to book an appointment.